The Team Africa Le Mans Ginetta G55 driven by South African racing legend Sarel van der Merwe, Le Mans 24-hour winner Jan Lammers and Dr Greg Mills finished first GT car home, second overall and won the Index of Performance in the South African Nine-Hour race at Killarney race track on Saturday 12 December 2015. This is their story. By GREG MILLS. All photos in this story by Heinrich Sauer Photography and Reynard Gelderblom. “Ambition, passion and cash-flow. Success in motorsport,” says Jan Lammers, “requires balancing all three of these aspects. Spend too much, and you might have success, but only for a while. Spend too little, and success will elude you. Absent passion, what’s the point?” he asks. Lammers, 59, is considered as one of the great all-rounders of the motorsport. When his Formula One career stalled in the early 1980s, he went into sports cars where he enjoyed stellar success, winning the Le Mans 24-hour race in 1988 with Jaguar, and twice the Daytona 24-hour. After stints as a factory driver for Toyota and Nissan, he started his own “Racing for Holland” team in the 2000s, taking on the might of Audi and Peugeot among others in a “David and Goliath” operation, twice winning the World Sportscar Championship in the process. He has competed in the Dakar rally five times, his sixth attempt is due to start in Argentina early in the New Year. He was in the country this past weekend to compete in the revived South African Nine-Hour endurance race. Staged at the Killarney circuit outside Cape Town, this is the first time the event has been run since 1982. I had met Jan 12 years ago when covering Le Mans for a local newspaper, the year his private entry finished sixth. He was then, and now, a most approachable personality, in spite of his fame. When I called him two weeks before the Killarney event to ask him if he would like to share the drive, he came back immediately with: “Yes, absolutely”. Illustrating his point about passion overruling commercial common sense, perhaps, he was keen to race simply to drive with Sarel van der Merwe. “It’s much more fun to be driving with Sarel than against him – if you can’t beat them, join them!” he says of the multiple SA champion and 1984 Daytona 24-hour victor, who he regularly competed against at Le Mans. Although Van der Merwe is best known in South Africa for his rallying exploits, in Europe and the United States, he is renowned for his speed in a fearsome selection of cars, including 1200 horsepower IMSA sports cars and the works Le Mans Porsches. During the 1960s and 1970s South Africa’s Nine-Hour was a feature on the international motorsport calendar, along of course with the Grand Prix. The endurance race pretty much disappeared along with the 1973 fuel crisis; the regular Grand Prix in the midst of political crisis and tightening isolation. Lammers was entered in the last GP to be held at Kyalami in 1993. The previous year he had staged a F1 comeback, with the longest-ever gap in F1 history between his last GP for the Macau-based Theodore team in 1982, and two races for a faltering March team ten years later. Its Japanese owner had been jailed, and the team had run out of money. Jan had found enough money for his Dutch team-manager friend Hennie Vollenberg to pay the wages, while his erstwhile team-mate was supposed to provide the cash for the Ilmor engines, later the engineering brains behind Mercedes F1. The financial chicanery might diminish as you go down the formula, but the sport is still a difficult way to make money. A long race like the Nine-Hour is a similar balancing act, demanding both speed and consistency. You want to be fast, but you also want to spend as little time stationary as possible. Despite an expertly engineered and managed car we knew that, with just 350 horsepower in our 1100 kg machine, we were not going to be as fast, at least down the straights, as the lightweight sports-cars or the more powerful Porsche GT3s. But we could minimise our time in the pits by running a conservative tyre strategy, demanding only one change, and at least one “double stint”, when the driver stayed in the car when it refuelled and so did back-to-back sessions. The one with the most brawn and least brain stepped forward for this task. After two hours I was completely knackered inside a helmet, balaclava and triple layer race-suit, and in a car with an ambient temperature around 65 degrees, where the cooling ducting had failed. My head had exploded, it felt. When the team asked if I could stay out for another ten laps after the fuel light starting blinking, personal survival demanded that I stopped glancing at the timer on the read-out in front of me. Supervan says an endurance series, pinned around the Nine-Hour, makes a lot of sense, offering “a lot of racing for the money, and much, much less expense than a GP”. It can also leverage the advantage of southern hemisphere sunshine when the north is clouding over. With over 30 entries in the inaugural revival this year, the stage is set to make this ambition a reality. 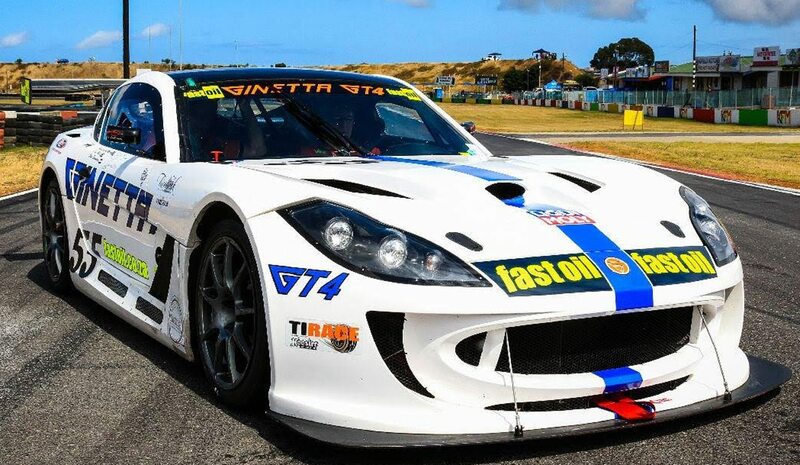 Co-driven by Sarel van der Merwe, Jan Lammers and Dr Greg Mills, the Team Africa Le Mans Ginetta GT4 finished second overall, first in class, and first on Index in South Africa’s Nine-Hour Endurance Race on 12 December 2015.